Motor-Racing's 5 Most Iconic Tobacco and Alcohol Sponsorships | Chicago Car Club - The Nation's premier buyer of classic cars! 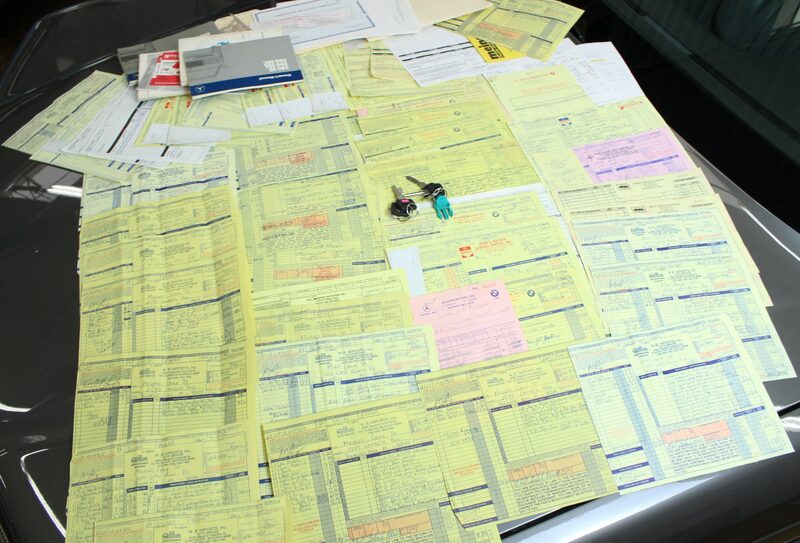 While alcohol and cigarette manufacturers’ advertisements were once plastered on the large majority of racing cars and circuits worldwide, times, and regulations, have changed. The long-term negative health effects of cigarettes and alcohol are now beyond doubt, so it’s been established that there must be a limit to the exposure of these brands to the malleable minds of young motorsport viewers. 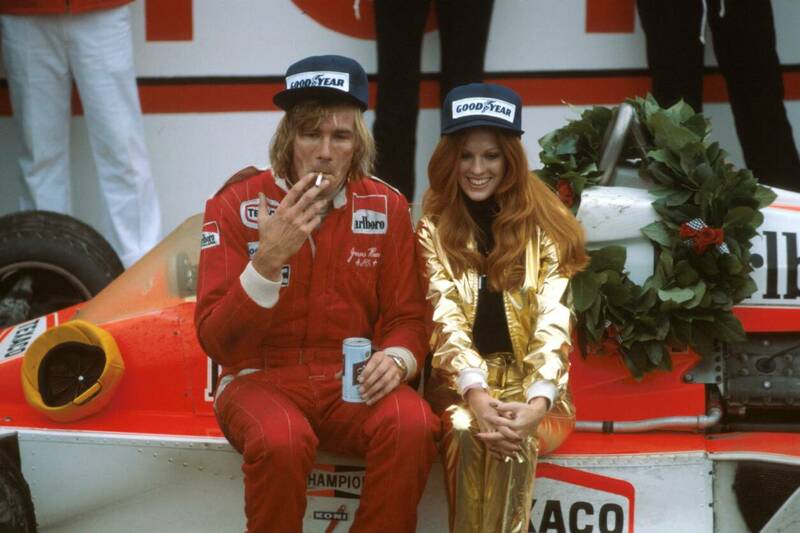 There was a time though that motor racing and the alcohol and tobacco industries were in close ties; for example, the 1970s. The expectations of drivers then was a bit different than it is today. Today’s drivers are expected to appear as model citizens in the public eye, as their opinions and behaviors are viewed as exemplary, and representative of those of their sponsors. Back then, drivers served to build the sponsors’ image where the executives couldn’t, in contributing the intangible ‘cool’ factor. 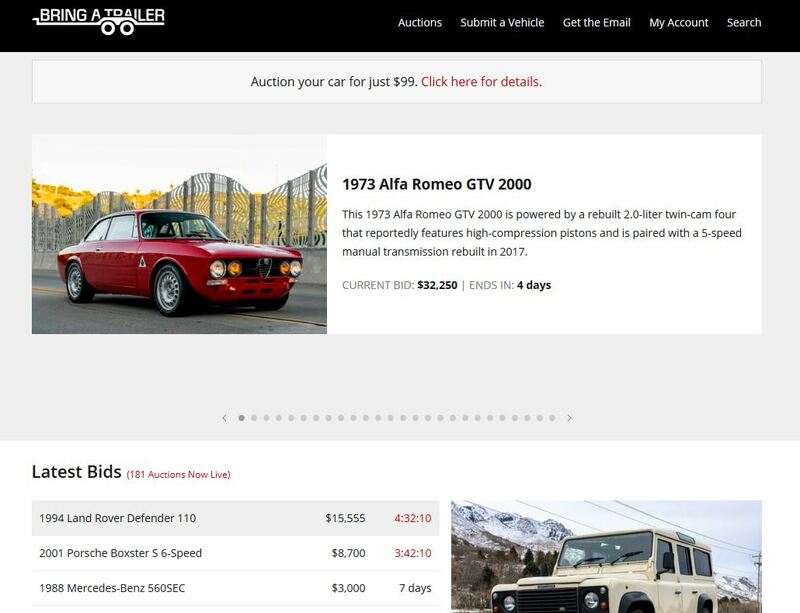 The carefree, young-forever charm sold; and it didn’t detract from the respectability of the organization that the driver represented, it simply humanized the brand and extended their reach. Racing’s young viewers tended to idolize those ‘cool’ drivers, the ones that were always seen with a cigarette, beer, and girl in hand. In hindsight, were the tobacco and alcohol sponsors’ longstanding close ties to motorsport a bad influence on the health of a generation of racing fans? Well, maybe. At the same time though, these sponsors brought phenomenal amounts of money into the sport of motor racing, which attracted the talents of the drivers that we’ve idolized. Bad influence or not, one thing is for certain, many of the liveries that emerged from this era of motorsport were true works of art. Italian vermouth distillery Martini & Rossi is hands-down one of the most iconic sponsorship programs in all of motor racing history. Having gotten its start in 1968, when advertising unrelated to racing was first permitted on the bodywork of racing cars, Martini’s sponsorship program has had a long, decorated history. The blue and red Martini stripes are still gracing circuits at the highest level of motorsport competition today, with their current sponsorship of Williams’ Formula One team. 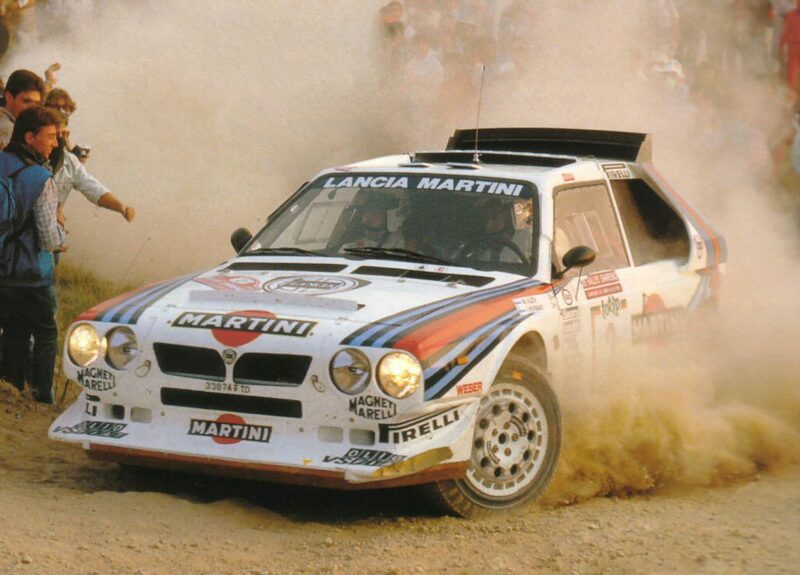 Martini’s most successful and instantly-recognizable sponsored-cars include the likes of Porsche, Lancia, and Alfa Romeo, while they’ve also sponsored race entrants from Ferrari, Ford, and Brabham. During the 1970s, Martini Racing became closely associated with Porsche’s motorsports division, having sponsored the Le Mans-winning Porsche 917 in 1971, as well as the Le Mans-winning 936 in 1976 and 1977. Martini sponsorship wasn’t limited to solely World Sportscar Championship cars like the 917, they also sponsored touring cars, Can-Am cars, and a number of rally cars, including the infamous Group-B Lancias. JPS, now under the Imperial Tobacco umbrella, was an England-based cigarette manufacturer. Their motorsports involvement began with their sponsorship of the Lotus 49 in the 1968 Tasman Series, a championship-winning car at the hands of the legendary Jim Clark. However, the iconic black and gold livery that we’ve come to know and love didn’t come into the picture until the 1972 Formula One season, when it was displayed on the Lotus 72 of Emerson Fittipaldi, who went on to win the Formula One World Championship driving for Lotus that year. JPS applied the same simple black and gold design language of their cigarette packaging to their racing cars, creating an unmistakable brand identity. 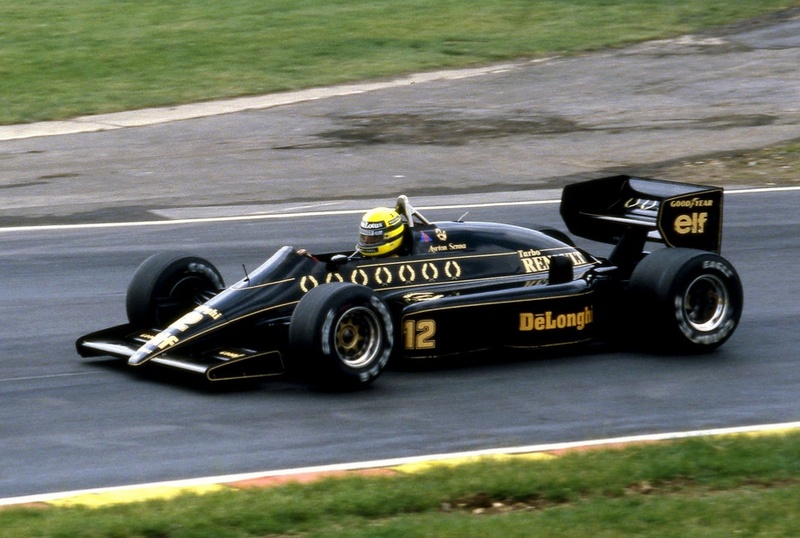 Because of its simplicity, understated yet sharp look, and its association with the impossibly-cool racing icons that piloted the JPS-liveried cars, including the late, great Ayrton Senna, the JPS black and gold livery has long been a fan-favorite in the motorsports community. Jägermeister, a company I’m sure we’re all familiar with, is a German liquor manufacturer. 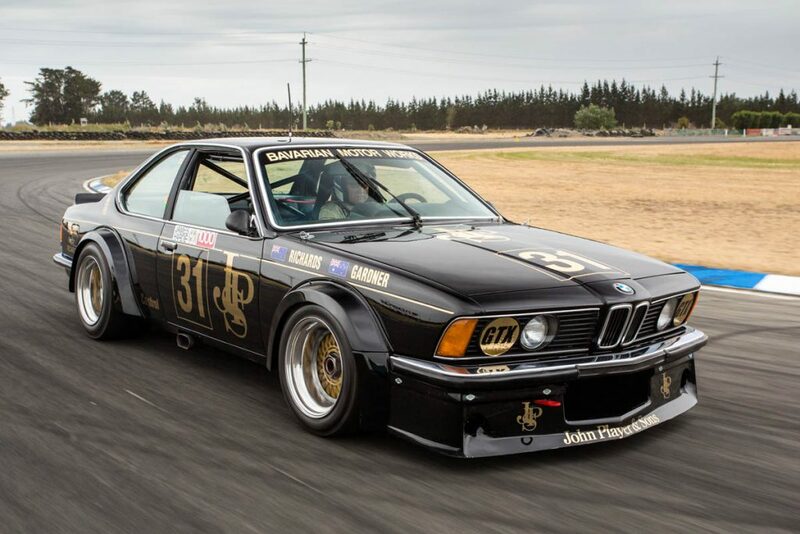 Throughout the 1970s and 1980s, Jägermeister was an instantly-recognizable sponsor of various European racing teams, primarily those who fielded BMWs and Porsches. 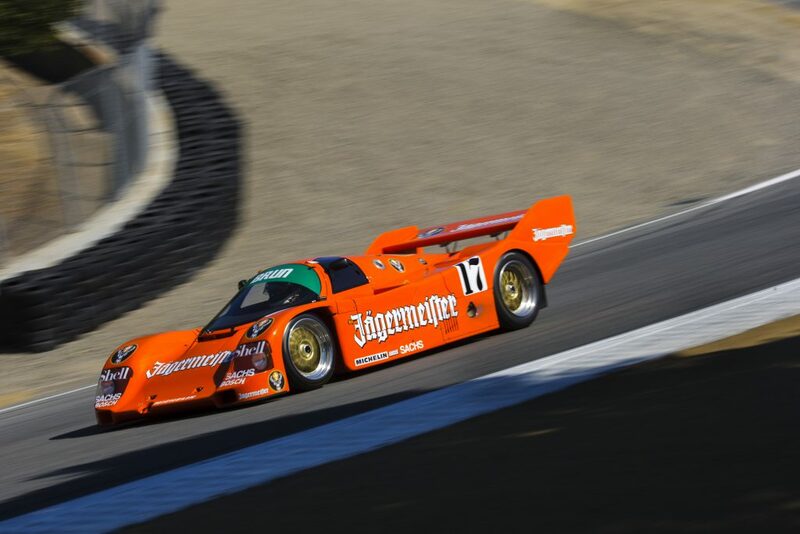 The in-your-face, bright orange livery bearing the Jägermeister name in bold white text is absolutely unmistakable. Their sponsored cars raced in a variety of series, including Formula One, DTM, and Group C, where the Jägermeister-sponsored Brun Motorsport Porsche 956/962 took home the 1986 World Sportscar Championship honors. Founded in 1890 as a small kiosk on a city street in London, Rothmans International grew to become a world-renowned Tobacco manufacturer. 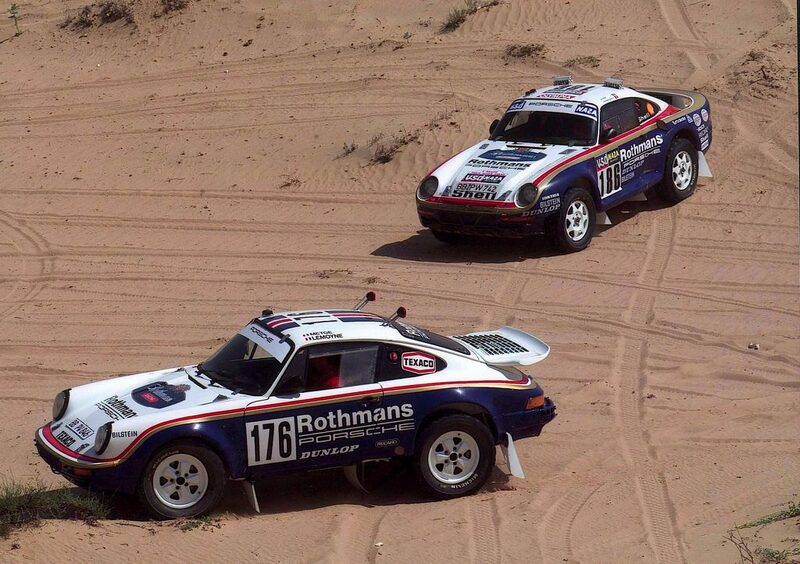 Much like Martini, Rothmans saw phenomenal success in partnership with Porsche. From 1982 until 1987, when Porsche withdrew from the World Sportscar Championship, Rothmans supported the factory Porsche racing efforts. In 1982, the Rothmans-liveried Porsche 956s took home a 1-2-3 finish at the 24 Hours of Le Mans, a massive feat. Rothmans Porsche came back to win Le Mans again the following year, 1983, then again in 1986 and 1987. 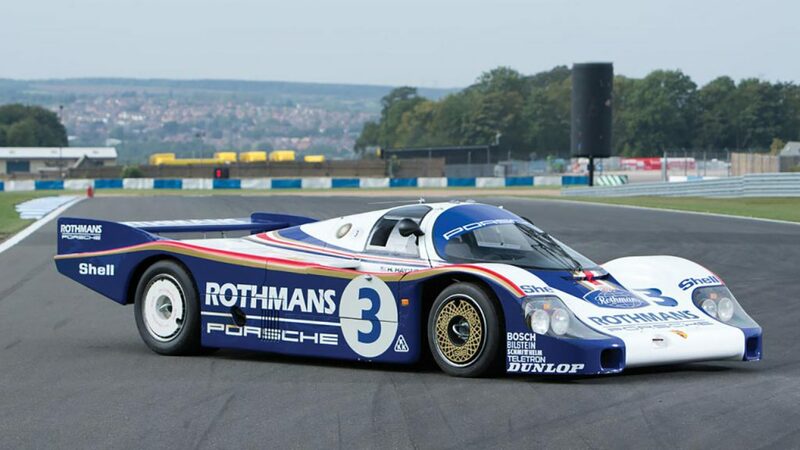 Rothmans Porsche even took the World Sportscar Constructors’ Championship title in 1985. It didn’t stop with the World Sportscar Championship, though. Rothmans’ sponsorship extended to rallying, where they sponsored Walter Rohrl’s World Rally Championship-winning Opel, as well as Porsche’s 1986 Paris-Dakar Rally-winning 959. Rothmans also sponsored Williams F1 from 1994-1997, though that is a dark time in Rothmans Racing history; in May of 1994, Ayrton Senna, widely considered to be the greatest Formula One driver of all time, was killed while behind the wheel of a Rothmans-Williams car, the crash due to an undisclosed mechanical failure. Marlboro, the worlds best-selling brand of cigarettes, is credited with being one of the most important sponsors of Formula One racing. The iconic red and white Marlboro livery has graced some of the most competitive and globally-adored racing cars of all time, and multiple Marlboro-sponsored drivers have achieved legendary status in the motorsports community. In 1974 Marlboro began their sponsorship of the McLaren Formula One team, which yielded an instant championship victory with Emerson Fittipaldi at the wheel of the McLaren M23. Two years later, charismatic British driver James Hunt took the 1976 Formula One World Championship title in another M23, after an incredibly competitive season battling Ferrari’s Niki Lauda. In 1982, Lauda signed with Marlboro McLaren, and continued their winning tradition. Lauda won his third world championship in 1984, taking the title by only half a point over his Marlboro McLaren teammate Alain Prost; between the two of them, the team had won twelve of the season’s sixteen races. Lauda left Formula One in 1985, but Alain Prost didn’t allow McLaren’s record of success to falter. Prost won back-to-back World Championships in 1985 and 1986, and looked to be the man to beat in Formula One. For the 1988 season, as per Alain Prost’s recommendation, Marlboro McLaren signed Brazilian driver Ayrton Senna, who had impressed Prost with his ability to find success while driving not-quite-championship-worthy cars at Lotus and Toleman. The 1988 season saw a previously-unseen level of one-sidedness, with Marlboro McLaren taking 15 of the season’s 16 races; Senna winning 8 races and Prost 7. Senna won the championship by a hair that year, and so began the bitter rivalry. Prost took the championship in 1989 after a tense year at McLaren, and consequently left for Ferrari, saying he found it impossible to work with teammate Ayrton Senna. With Prost out, Senna cleaned up, winning back-to-back world championships in 1990 and 1991 and establishing himself as one of racing’s elite. 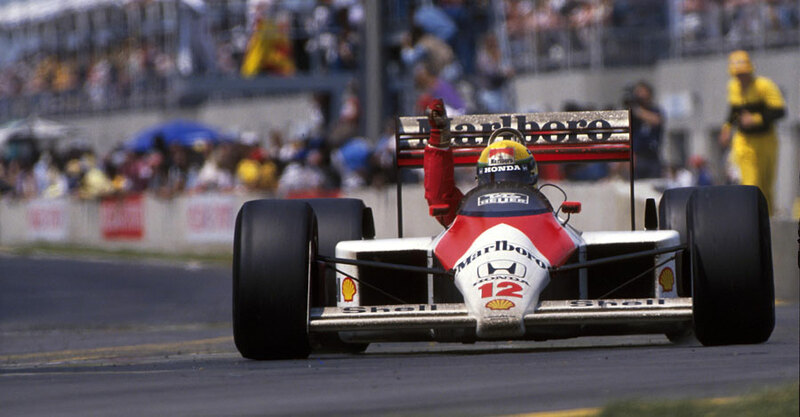 Senna left McLaren in 1993; following his departure, Marlboro McLaren didn’t win a single race for three years. With the downturn in performance, Marlboro had no choice but to drop their sponsorship of McLaren and look elsewhere. They turned to Ferrari, where they became primary sponsor for the 1997 season. At Ferrari, Marlboro found exactly what they were looking for. 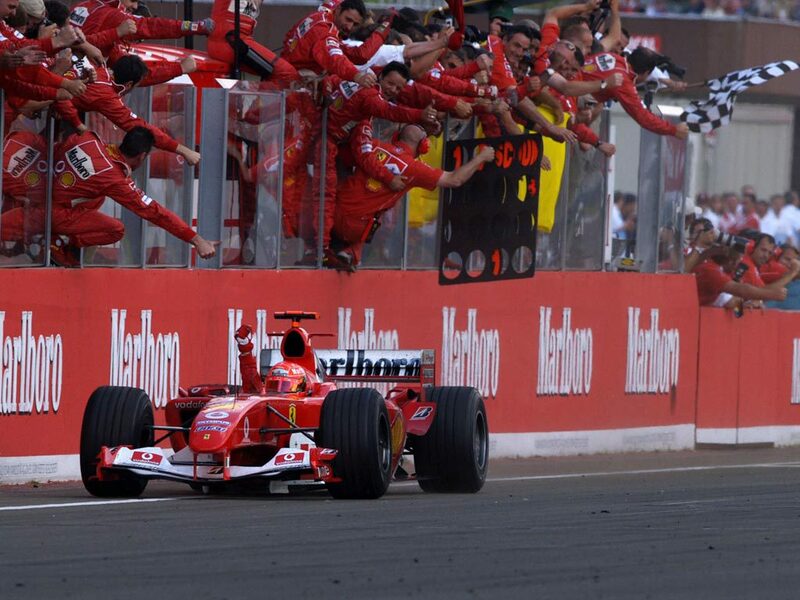 Ferrari had just signed two-time world champion Michael Schumacher, and they had a very competitive car. Here at Ferrari-Marlboro, Michael Schumacher began the run that would make him the most decorated Formula One racing driver of all time. He won the world championship five consecutive times from 2000 to 2004, then finished in the top three overall in 2005 and 2006. Three decades of a consistent wins have solidified Marlboro as a key player in Formula One’s history and its development as a sport; Marlboro even continues to sponsor Ferrari to this day, despite the ban on visible tobacco sponsorship on the cars.